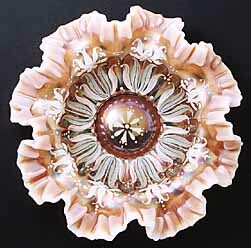 In addition to water sets, the makers of Carnival Glass also decorated some of their existing patterns, including bowls and plates. Dugan seems to have made the majority of these pieces, although rare examples can be found in Northwood, Fenton, and Imperial. The Dugan Stippled Petals above has beautifully painted flowers while the Plain Dugan bowl on the right with crimped and ruffled edge has elaborate abstract flowers and leaves radiating out from the center. Courtesy of Tom and Sharon Mordini. 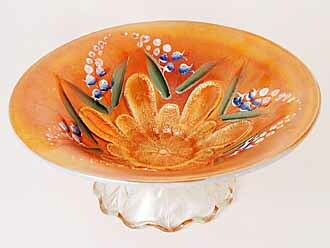 Listed below are a few decorated bowls and plates that have sold in recent years.